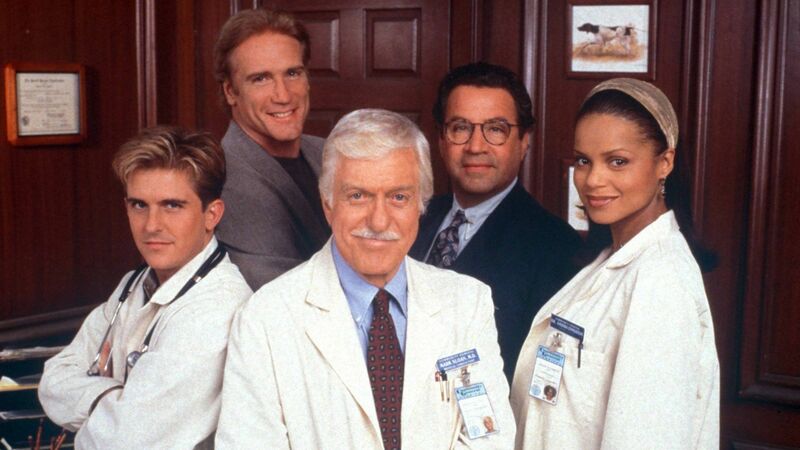 Here's where to watch every episode of Diagnosis: Murder season 8. Mouseover or tap an episode to see where to stream it. Click or tap the play icon to stream it on the best available service. Death By Design Oct 12, 2000 Mark's office decorator is murdered. Blind Man's Bluff Oct 19, 2000 Young woman is in a car accident and goes blind, Mark must figure out who committed the murder. Sleight-of-Hand Oct 26, 2000 A body found on the beach turns out to be Jim, the hospital janitor, but when his twin brother Jeff shows up to identify the body, Mark and Steve become suspicious. By Reason of Insanity Nov 2, 2000 Dr. Mark Sloan tries to save one of his former students, a schizophrenic, from a murder charge, but is challenged by the man's seemingly incoherent babbling. The Patient Detective Nov 9, 2000 Steve nearly dies in a car accident and think a murder happens. No one believes him. The Cradle Will Rock Nov 16, 2000 A nurse's husband is murdered and a teen who works at the hospital and who also had a torrid love affair with the nurse is the prime suspect, but Mark isn't convinced that the young man is the killer. Hot House Nov 30, 2000 An abusive man who, along with four other people, was a contestant on a reality show is murdered while living in a house that is monitored 24 hours a day. After the killing, Mark enters the house as the man's replacement to see if he can uncover what happened. All Dressed Up and Nowhere to Die Dec 7, 2000 Mark goes after a man who killed a groom on his wedding day. Confession Jan 4, 2001 Dr. Mark Sloan, Lt. Steve Sloan and Dr. Amanda Bentley become involved when a priest is accused of murdering an old friend. Playing God Jan 11, 2001 Dr. Mark Sloan seeks the murderer who killed a med student, drained his blood, and stored him in the Community General morgue. Less Than Zero Jan 18, 2001 An actress with an eating disorder dies from an apparent heart attack. Mark believes her nutritionist murdered her. Sins Of The Father (1) Feb 2, 2001 A young woman is assassinated while Dr. Mark Sloan is examining her, setting off an investigation that plunges Mark into dark memories of his own childhood. Sins Of The Father (2) Feb 9, 2001 Mark must find out why his dad left him as a child. You Bet Your Life Feb 16, 2001 Dr. Mark Sloan investigates the apparent suicide of a gifted heart surgeon who was also a compulsive gambler. Bachelor Fathers Feb 23, 2001 Dr. Mark Sloan tries to solve the murder of a young woman whose twin sister claims that Dr. Jesse Travis fathered her infant son. Being of Sound Mind Mar 2, 2001 Dr. Sloan tries to save Jesse and Amanda from a murderer who is out to kill them in order to obtain a multi-million dollar inheritance. Dance Of Danger Mar 30, 2001 A Tabloid-news paper reporter gets caught up in a murder investigation when one of her sources is stabbed to death on a dance floor. The Red's Shoes Apr 20, 2001 Dr. Sloan tries to Amanda when she becomes involved in an incident involving the Chinese government. No Good Deed Apr 27, 2001 Dr. Sloan investigates a controversial attorney who confesses to murder while near death but recants after he recovers. Deadly Mirage (1) May 4, 2001 While deeply disturbed that his son, Lt. Steve Sloan, is falling in love with a woman who is a dead ringer for his murdered former girlfriend, Dr. Mark Sloan begins watching his neighbors through binoculars and becomes convinced that one of them is a murderer. Deadly Mirage (2) May 4, 2001 While deeply disturbed that his son, Lt. Steve Sloan, is falling in love with a woman who is a dead ringer for his murdered former girlfriend, Dr. Mark Sloan begins watching his neighbors through binoculars and becomes convinced that one of them is a murderer. The Blair Nurse Project May 11, 2001 When a filmmaker begins using Community General Hospital as the location for an eerie documentary, Dr. Sloan discovers it may be haunted.